I decided it was a perfect day to make a batch of tomatoe sauce for canning. I remember my grandmother making basically everything she could and we canned every season, making sauce, jam, jelly, and simply preserving fresh veggies to be consumed later. I am grateful for the memories and the knowledge she instilled in me and I love getting to use her pot to do these tasks myself. So I figured I would share a bit of the process with you all. It is a good idea if you’re trying to save some money off the grocery bill and maybe you are wondering what you’re going to do with all those extra veggies from the garden. Pulling out some old school tips and tricks can help you with that! 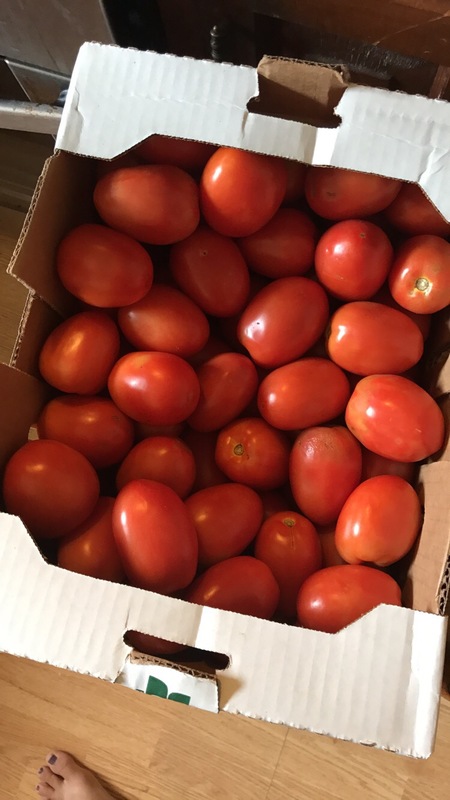 If you’re going to make your own sauce you’re going to need a lot of tomatoes ! Maybe you don’t need a whole case but if you have a local produce market you might want to load on up ! The case was $14.00 , I already have jars laying around and almost always have the other basic sauce ingredients on hand. 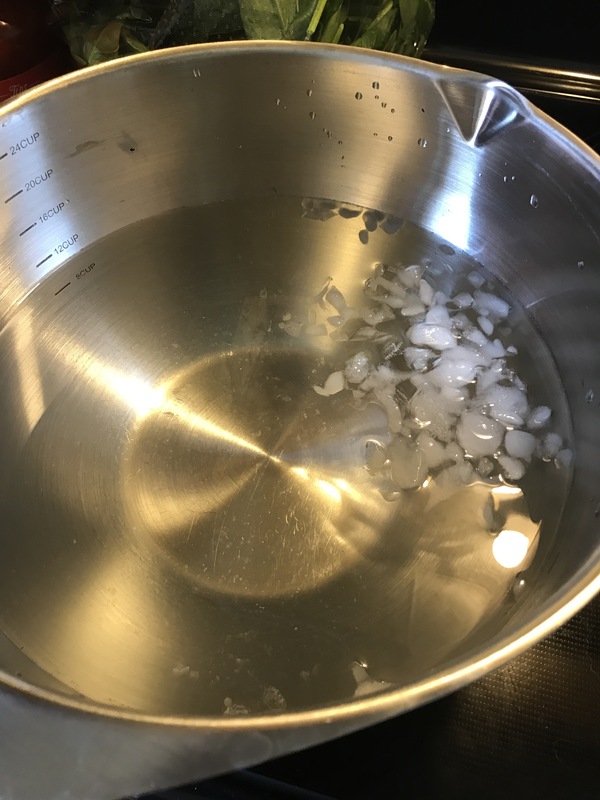 I just make a basic sauce for canning and will doctor it up as I decide what I’m doing with it. 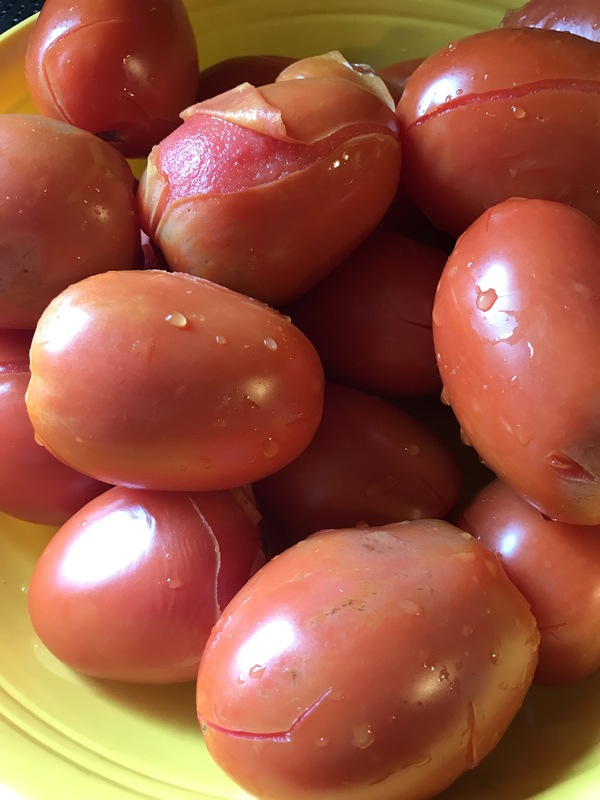 First you need to remove the skins from the tomatoes. Now some of you may be wondering how in the world you are going to accomplish that without a lot of waste. It’s actually very simple , just time consuming! Making anything from scratch is going to take up some time. Ok so back to the easy peeling process. You will need a large pot of boiling water , a bowl of ice water (an ice bath) and an empty bowl. 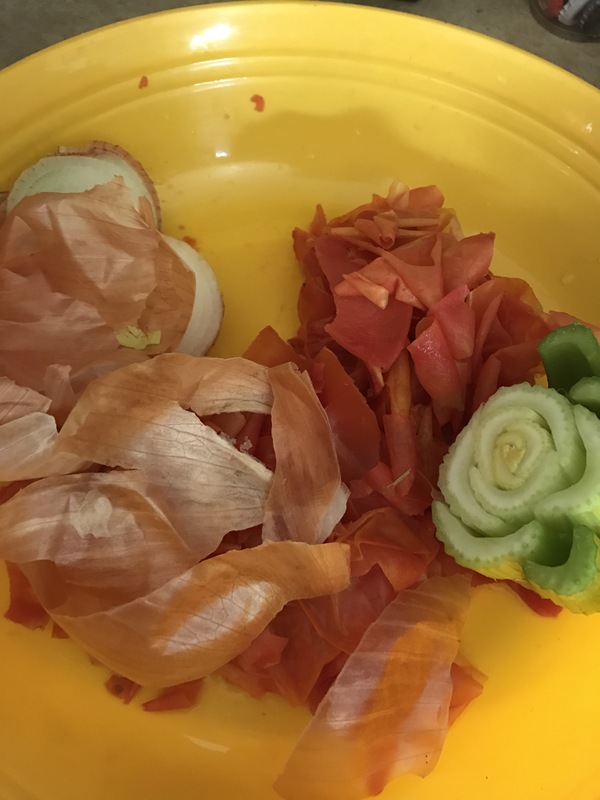 You are going to start by making an X on the top and bottom of the tomatoes , don’t cut too deep your just scoring the skin to make it easier to peel. You can also take out the core but you don’t have to. 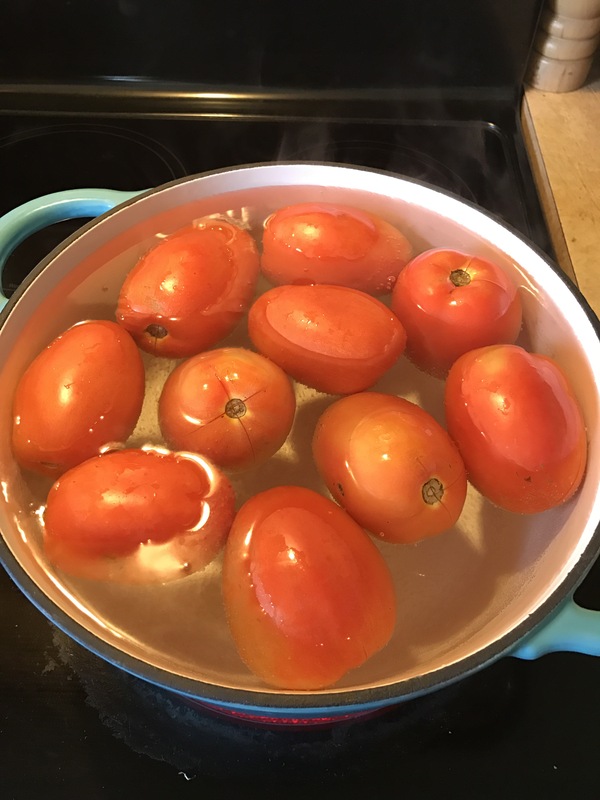 Drop a few prepared tomatoes into the boiling water for 20-30 seconds , with a slotted spoon or tongs remove tomatoes from the boiling water and put them in the ice bath. You just want them to cool so you can handle them, don’t let them sit too long in the ice water. You will see that the skins will crack and peel , that’s what you are looking for. Now your tomatoes are easy to peel and ready for whatever project you’re working on ! Extra tip: save your veggie scraps in a freezer bag to make stock with later ! Make sure to avoid starchy foods like eggplant and potatoes.